All books using the keywords: Amanda Elo'Esh Johnsen, M.A. Go Ask Alice Oracle & Tea Party Game Amanda Elo'Esh Johnsen, M.A. 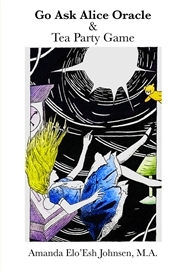 The Go Ask Alice Oracle & Tea Party Game is an oracle and a tea party game based on the crazy characters and adventures found down the rabbit hole in Wonderland. Draw a card and look up the oracle meaning to answer your most important questions or use the cards to play an engaging and lively ("Frabjous! ", as they say down the rabbit hole) tea party. Or simply use it as a reading companion to give you deep insights into the wisdom treasures hidden inside of the stuff and nonsense of Lewis Carroll's famous adventures.